Another month has been and gone and this time we celebrated Easter in the midst of everything. We had a fun filled Easter Party and were entertained by Graham and Kiah who put on a cracking show for us. They sang a wonderful mix of popular songs getting everyone waving their arms, tapping their feet and one or two dancing. We enjoyed a buffet afterwards with a wide range of delicious nibbles and treats. 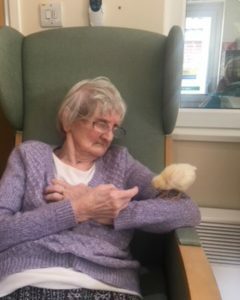 We also had a leg of Lamb for lunch on Easter Sunday and each resident received an Easter egg. The weather has been starting to get warmer and feel more like spring therefore we have been able to spend more time outdoors. The garden has been occupied by most residents at some point which is lovely to see although it is evident that some residents dislike sun cream but unfortunately, we have a duty of care to protect your vulnerable skin from the sun. Our pub lunches have continued fortnightly and are as popular as ever. The ladies from Bisley church continue their monthly visits and held a special Easter ceremony to reflect on the true meaning of Easter from a religious perspective. Bailey our PAT dog visits on alternate Friday’s and our residents thoroughly enjoy stroking him and petting him, he is a friendly dog who loves the attention. Tina from High Kicks and Heels did her monthly performance to the usual high standards. At the end of April our chick eggs from ‘Incredible eggs’ were delivered and kept in the incubator for a day or two before they hatched. We had two fluffy yellow chicks and two yellow and black chicks that were absolutely adored by everyone. All residents had a hold of the chicks and were intrigued by their growth progress. It was a wonderful process watching their journey from eggs to quite boisterous chickens! Their growth and development in just a week was interesting and a joy to watch. We will all miss our chicks when the time comes for them to go back to the farm as we have grown very attached to them. We had our quarterly resident and relatives meeting in April which was relatively well- attended. Meeting minutes will be sent to relatives with your monthly reports. May will bring the Circus to Bisley Green. Anyone who wishes to go to the circus will be escorted by staff to one of the performances. We have been going to the circus for several years now and residents enjoy seeing the clowns, acrobats, magicians and jugglers. We are lucky that we do not have far to go to get there. There is the Royal Wedding to look forward to in May. Several residents are excited about this and are intrigued as to what the bride will be wearing and the guests. We will be watching the ceremony on television and will have a celebration party within the home. Our usual visits from the church, PAT dog, hairdresser, chiropodist and high kicks will all continue. Dates are on the notice board. The much anticipated ‘Teas on the rec’ will be re-commencing soon which we are eagerly awaiting for the summer months. We welcome Alan Nurney to Elmfield House. His son knew of Elmfield through the Coign Church where he is an active member. Alan has settled well and is enjoying the company of others. Fanelli Thaddeus has joined the care team and is currently on induction on days but he will be going onto night shifts from June. There were no birthdays to celebrate in April. We have Colin Chaldecott’s birthday to look forward to mid- May. A massive Thank you to everyone who has replied to the Carehome.uk reviews. We have achieved a 9.8 rating which is fantastic! All feedback is valuable and appreciated. We use our Quality Assurance Questionnaires to gain feedback and to assess the service we provide and to improve by acknowledging suggestions. We will be purchasing a BBQ so that we can have BBQ’s within the home which was suggested recently by residents and has also been discussed with the owners in previous years. Risk assessments and guidelines will be developed before we have a BBQ but it will be something to look forward to in the near future, of course weather permitting! We are looking at doing some charity work in the coming months as we tend to do each year. Ideas include sponsored events, a fun afternoon, raffles, packing shopping bags and car washing. You will be kept up-to-date with anything finalised. Joanne Carter has been awarded with ‘Employee of the month’ for April. This is due to her consistently high standard work- ethic, professional attitude, loyalty and willingness to work overtime week in week out. Well done and keep up the good work!